Or: How a small state became essential within the commercial networks of the ancient world. – After uniting the three poleis of Rhodes in 408 and founding a new capital on the island the Rhodians quickly became a Hellenistic power to be reckoned with, especially at sea. They quickly made trading connections all over the Mediterranean, supported by their great diplomatic skills and a navy which didn’t trust on size or quantity, but on great tactics, speed and maneuverability. Many small islands saw them as the protectors as freedom, while pirates saw them as their worst nightmare. During a balance of power between the mighty kingdoms they were the ones feeding the Aegean, bringing grain to them from both Ptolemean Egypt as the Black Sea. Only when Rome became to dominant halfway through the second century, Rhodes period of prosperity finally came to an end. During my research I’ve tried to take a look at how a small island state could manage to hold its head up high surrounded by extremely powerful monarchies in the Eastern Mediterranean world of the Hellenistic period. While we must remain critical of the sources, Rhodian historians tended to stress mainly their successes, one surely sees excellence at sea and diplomacy during a period not traditionally regarded to be full of excellence. The ages separating ancient Athens from Rome’s ascent weren’t as uninteresting as some handbooks would like you to believe. First things first, although the island of Rhodes has been inhabited by Dorian Greek during both the Archaic and Classical Period the three separate poleis of Ialysos, Camirus and Lindos proved nowhere near strong enough to withstand the power of the almighty Athenians and Spartans. During the 5th century a steady rise of ‘island community’ has been seen developing for instance at all-island cults. This helped to prepare an union which inevitably came in 408 B.C. , the so-called synoecism. This was fortified with the erection of the city of Rhodos, with its great harbours and strong walls. For some eighty years the newly established Rhodian republic was still in its infancy, but they finally kept their engine running halfway through the fourth century. In 330 they already were strong enough to retain their trading position despite Alexander the Great and his armies being nearby. Although the natural possibilities of the island were rather small, its richness was brought to Rhodes by its trade. They needed to import grain (to feed the republic) and timber (to build the ships) and thus trading formed a crucial role in all Rhodes’ diplomatics and policy. Rhodian traders quickly managed to get ateleia, economic privileges at several ports all over the Mediterranean like at Syracuse and in Seleucid Asia. The island had already been established as the emporium for the Egyptian trade as was recognized by Alexander’s governor in Egypt. This growth continued and Rhodes became known as the clearinghouse and banker of the eastern Mediterranean. Rhodian merchants and financiers were found in all Mediterranean commercial hotspots. After the earthquake of 228, which also destroyed the world-famous Colossus of Rhodes, a symbol of their wealth, monarchs from all over the map could hardly wait to help the Rhodians get their economy back together. The role of the Rhodians had already become so important that a disaster like that had a big impact all over the commercial Mediterranean network. Their activities as international bankers and traders had already become vital within the Mediterranean trading network. It clearly proves that Rhodes had managed to tie networks from north to south and from west to east. 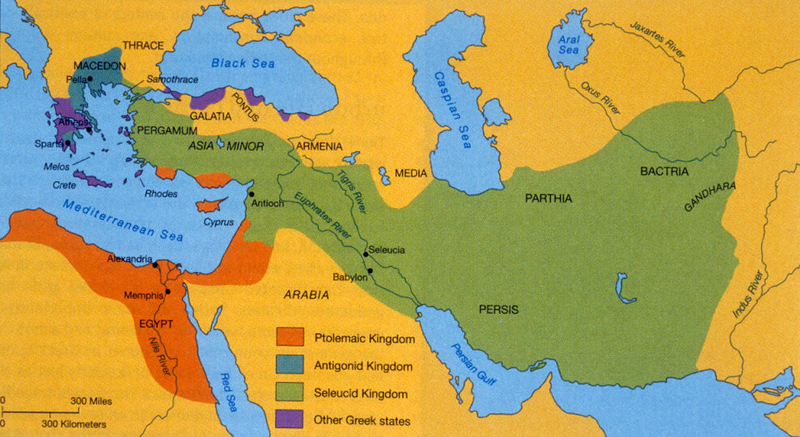 An essential role existed for the grain of the Black sea and Ptolemaic Egypt. After Alexander’s death the Rhodians were virtually in possession of a grain trading monopoly. 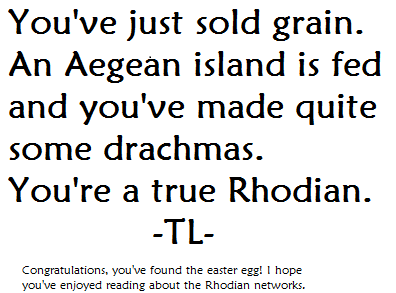 Rhodian financers found ways to even profit from Crimean grain deals with the Aegean that never ever passed Rhodes’ ports. Besides grain, Rhodes also provided luxury goods and some slaves from the East and its one wine. Instead of Delos, Rhodes harbors were perfectly suitable for trading grain though.. Besides the Agonids, Seleucids and the Ptolemies in the third century Rhodes probably was the richest state in the Hellenistic East. Likely goods 50 million worth of drachmas (ancient currency) passed through the Rhodian harbors each year at some point at the early second century. If we see Rhodes as a body, their diplomats were their eloquently speaking mouth, their economy was their spine and their navy was their muscles. Rhodes liked to work-out and the pirates of Crete acted as their sparring partner. They were no match for Rhodes, backed by both small islands, who in owing the freedom of their merchants to Rhodes became their natural ally as the big powers like the empire of Ptolemy who didn’t see Rhodes as a threat but as a great business partner. Another example sprout from archaeological evidence of Rhodian stamped amphora handles. One of its, or maybe the most important originally Rhodian product of exports was Rhodes its wine, traded in specially marked Rhodian amphorae. This trade reached its top around 225-150. During this, from a Rhodian perspective, successful period of wine trade Rhodes was on top at both Athens, Delos and Alexandria. After 150 however it was surpassed at Athens and Delos by Knidian wine according to archaeological evidence. In the 2nd century, even after losing its autonomy to Rome, which had become too strong for the big Hellenistic powers, let alone Rhodes, they remained the strongest trading partner of Egypt. There’s much evidence Rhodian wine trade survived in the 2nd century. The Rhodian traders seemed to have just changed their focus after Rome declared Delos a duty free port. However, I must remember the reader that Rhodes was an a-typical exception in the Hellenistic period, it was one of the only truly successful city-states, crucially linking different networks of food suppliers. Small as a spider, but strong as their web, for almost two centuries they couldn’t be missed in the Eastern Mediterranean commercial network. Constantakopoulou, Christy. The Dance of the Islands: Insularity, Networks, the Athenian Empire and the Aegean World. Oxford: Oxford University Press, USA, 2010. Gabrielsen, Vincent (ed.). Hellenistic Rhodes: Politics, Culture, and Society. Aarhus, N.: Aarhus University Press, 2000. Gabrielsen, Vincent. Naval Aristocracy of Hellenistic Rhodes (studies in Hellenistic Civilization). Aarhus: Aarhus University Press, 1997. Wiemer, Hans-Ulrich. Krieg, Handel Und Piraterie: Untersuchungen Zur Geschichte Des Hellenistischen Rhodos. Berlin: Akademie Verlag, 2002. MapHellenisticKingdoms. June 12, 2013. Accessed June 12, 2013.http://www.usu.edu/markdamen/ClasDram/images/05/MapHellenisticKingdoms.jpg. mediterranean_map, June 12, 2013, accessed June 12, 2013,http://www.utexas.edu/courses/fallofgreece/mediterranean_map.jpg.